Bread - Great job, Missy! Carpet - Great job, Mama Whimsy! Lauren, you cracked me up with the Spider Bedding guess! You just know me so well! Sunflower Seeds - Great job, Purple Dancing Dahlias! I love seeing them as rocks, though. Bubble Wrap - too easy! Lava Rock, actually a BIG one, at a cemetery. Great job, Lauren. Pumice stone could also be considered a correct answer. One of my favorites! This is actually the lid to one of those plastic turtle sandboxes! 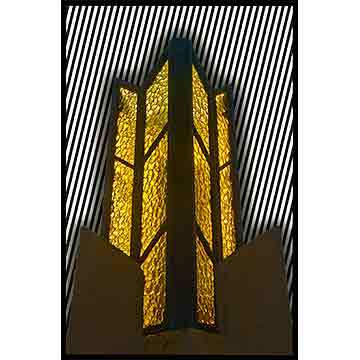 A glass brick lit up from the inside as part of an Art Deco Mazzios in midtown Tulsa, OK - I couldn't find any good pictures of the location. I won a ribbon at the local fair for a similar photo highlighting a brick lit up with green and red. No one ever gets this one! It is a rubber glove for doing dishes, etc! The answers on this one always amuse me. Filter was close enough, I think. This is the outside of the A/C unit at my old house. A stack of ash trays on the bar in a restaurant at lunch time. I hope you all enjoyed playing! I should take more macros (these are old) and play again some time. I love sharing these.